On the September 8, 2017, the European Commission published a new list of European harmonised standards for the following directives: the Low Voltage Directive (2014/35/EU) the ATEX Directive (2014/34/EU) If any of these directives apply to your products, we recommend you to check if the standards you or your suppliers have used have been amended, or that new relevant standards have been included in the list. The following standards have been added to the list for the Low Voltage Directive: EN 60335-2-9:2003 – Household and similar electrical appliances — Safety — Part 2- 9: Particular requirements for grills, toasters and similar portable cooking appliances – IEC 60335-2-9:2002 (Modified); EN 60335-2-9:2003/A2:2006 – IEC 60335-2-9:2002/A2:2006; EN 60335-2-9:2003/A13:2010/AC:2012 ; EN 60335-2-9:2003/A13:2010/AC:2011 ; EN 60335-2-9:2003/A13:2010 ; EN 60335-2-9:2003/A12:2007 ; EN 60335-2-9:2003/A1:2004 IEC 60335-2-9:2002/A1:2004 . The following standards have been added to the list for the ATEX Directive: EN 1839:2017 – Determination of the explosion limits and the limiting oxygen concentration (LOC) for flammable gases and vapours; EN 14986:2017 – Design of fans working in potentially explosive atmospheres; EN ISO 16852:2016 – Flame arresters — Performance requirements, test methods and limits for use (ISO 16852:2016); EN 60079-30-1:2017 – Explosive atmospheres — Part 30-1: Electrical resistance trace heating — General and testing requirements (IEC/IEEE 60079-30-1:2015 (Modified)). The PDF documents with the new lists of standards have been added to the CE Marking Library of our online platform already. The new and amended standards are being included in the standards database. If you have questions, please let us know. Post about three new standards related to window blinds that were adopted by CEN: EN 13120:2009+A1:2014, EN 16433:2014 and EN 16434:2014. 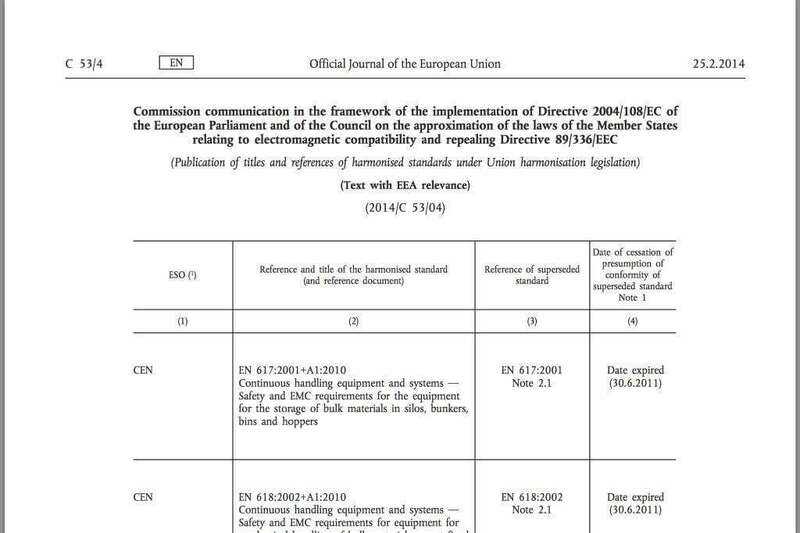 The European Commission has published the list of titles and references of harmonised standards under Union harmonisation legislation in accordance with the Electromagnetic Compatibility Directive 2004/108/EC. Are you a manufacturer of products that need to comply with the EMC Directive? Then this list concerns you. If you have applied standards to prove compliance with the aforementioned directive, we recommend you to check the new list of standards to see if any of the standard you applied have been updated, or whether there are new standards available for your products. When standards have been updated by this list, you need to re-evaluate your products against the updated standard and update your Declaration of Conformity. The complete list can be downloaded here. The updated list of standards can be found in our Library shortly. On December 13 2013, the European Commission published an updated list of the European harmonized standards that pertain to the Personal Protective Equipment Directive (89/686/EEC). The standards on this list may be used by personal protective equipment manufacturers to prove that their equipment complies with the essential requirements of this directive. List Standards for Machinery[/caption]On 28 November 2013, the European Commission published an updated list of the European harmonized standards that pertain to the Machinery Directive (2006/42/EC). The standards on this list may be used by machinery manufacturers to prove that their machinery complies with the essential requirements of this directive. 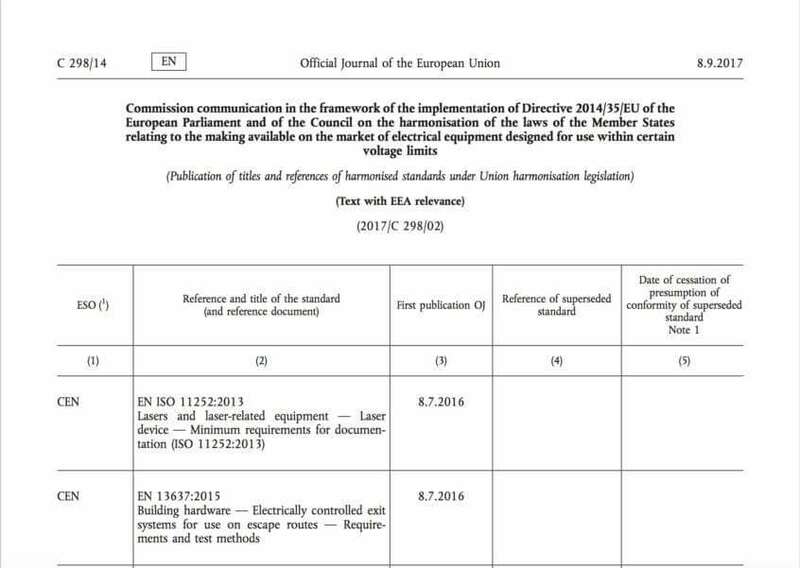 Within 3 months of the last update, the European Commission on Thursday published an update to the list of European harmonized standards that pertain to the Low Voltage Directive (2006/95/EC). Manufacturers of CE marked electrical equipment should if the standards they have applied for the CE marking testing or conformity assessment have been updated, or whether new relevant standards have been introduced.